The perfect light, fresh, and tangy spring dessert! Combine flour and powdered sugar in a medium sized bowl. Cut butter into 1/4 inch pieces and add to flour mixture. Using a pastry cutter or your hands, combine the butter with the flour until the mixture becomes crumbly. Press crust mixture into the bottom of an 8×8 pan lined with parchment paper. Bake for 20-25 minutes or until the top is golden brown. Add the eggs, lemon juice, and honey to a large bowl or the base of your stand mixture and beat on high speed until the honey is fully incorporated, then mix in the flour and baking powder. Pour the lemon filling over the crust and bake for 25 minutes, until set. Let cool for at least one hour, then sprinkle powdered sugar over top and serve! 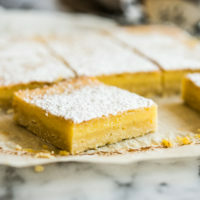 **You can use coconut sugar in place of the powdered sugar called for in the crust, but just note that it will result in a more crumbly crust. **For a dairy free option, you can substitute ghee for butter. **For a low FODMAP option, you can substitute white sugar for honey.